If you were a little worried about Aquaman – a DC movie about an underwater king with a taste for terrible, terrible clothing – then you can put those fears to rest. Most everyone loves it. The very first reactions are now available thanks to the ol’ pesky social media embargo ending. While not everyone is fully on board, there’s lots to like about James Wan’s comic book directorial debut. Epic. Crazy. Bonkers. The main through-line for Aquaman is that, if you’re planning on watching it, you’re going in knowing you’re about to have a great time. This feels like an old-school comic book movie, and the perfect antidote to some of the darker trappings of the DCEU. If you thought his turn in Justice League was something, you ain’t seen nothing yet. 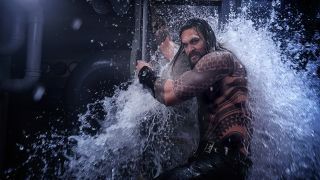 Jason Momoa turns up the fun dial to 11 according to the first reactions – which makes a great movie even greater. While many of you are doubtless wondering if it’s better than Man of Steel or Justice League, some are going even further back and comparing it to Christopher Nolan’s Dark Knight Trilogy. That can only be a good thing. The MCU? Lord of the Rings? Hideo Kojima? Everyone seems to have had a lot of fun comparing Aquaman to movies, superhero or otherwise. You know what they say: loose lips sink ships. Knowing that, there’s not been a lot around regarding Aquaman villains Ocean Master and Black Manta. The latter, however, is getting praise as a standout. Don’t go in expecting a classic. Hype is good, but reining in expectations might be the best thing for you right now. Here are some of the more balanced takes. 7/10. That’s put us out of a job.